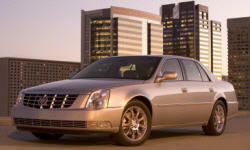 Cadillac DTS Exterior Styling Pros and Cons | Page 1 of 1 | Why Not This Car? Love the look of my Caddy DTS; long, low, nice front, nice rear, chromed alloys, dark red clearcoat with gray gut, always get looks in this car. Great Ride & Comfort. Engine will send you to the poorhouse. Stay away! Excellent looking car...Cadillac Art & Sciene design. Body will age well. It has a very sporty look for a larger car. Its a love it or hate styling. I like the front end but the rear end looks a little to bland.